This week we are proud to have Russ Hanley. When we celebrate an anniversary it gives us an opportunity to look back on the years that have come and gone, what has been accomplished, and did we take part in these accomplishments. In the summer of 1957, I traveled to Reno to marry my true love, Angela, and bring her home to San Bruno to begin our life together. St. Bruno�s was our first Parish, but after buying a home on Elm Avenue in 1959, St. Robert�s became our forever Parish. 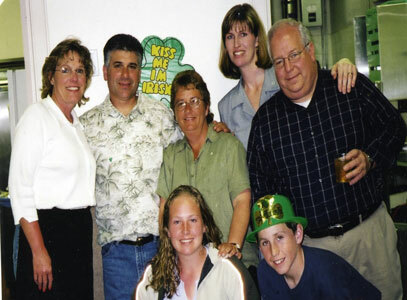 When you look back over the years in our Parish, the memories associated with St. Robert�s are many. This Parish has been an important part of my family with Baptisms, Religious Education in the CCD Program, Confirmations, weddings and a funeral. All of these events occurred in a Parish that is full of caring, thoughtful people, some of whom I�ve been associated with for many years. It has been my privilege to serve on the Parish Council, School Board, the Finance Committee and as a Eucharistic Minister. When our daughters Susan and Diane were attending the CCD Program, Angela and I became involved in the program as teachers, along with the wonderful staff that taught all of the children about their Catholic faith. As I read through �Journey Through the Years� by other Parishioners, the theme of community has been key to the success of St. Robert�s as a Parish. I have seen the many changes that have occurred to the physical plant of this Parish, including new stained-glass windows, the remodeling of the altar, and especially the building of the Presentation Education Center. This is a blessed community, that began with the first gathering of people at the first Mass, and continues to this very day. 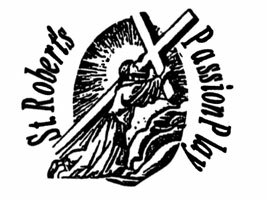 St. Robert�s is a place where we come to publicly express our faith, joining others to give proof of our Communion with God and one another. At St. Mary�s Cathedral, S.F. Mass of the Lord�s Supper, 7:30 p.m.
Celebration of the Lord�s Passion, 1:30 p.m.�3 p.m.
7:30 a.m., 9:30 a.m. and 11:30 a.m. While you are away during the Easter Break check www.masstimes.org for Mass schedule in other cities. As a Parish Community we pray ... For all who follow Christ may our faith, our hope and our love turn hatred to love, conflict to peace and death to life eternal. Thank you so very much, St.. Robert�s parishioners, for your generosity! This week, you donated $2765.45 for bed nets. 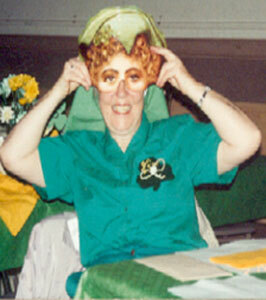 One of our Sisters has just returned from Tanzania where we have five houses and 19 Tanzanian Sisters. I had hoped she might address the parish at one of our liturgies, but she is not yet up to that task, since she has a mild case of malaria. Malaria is a parasitic disease which stays in most people�s systems even after the symptoms are treated effectively. Symptoms are severe headache, nausea, convulsions, anemia, chills and high fever. We can easily imagine how difficult it would be to do the simplest tasks if one had malaria! And most of the African people don�t have access to medication. So it�s all the more essential to keep them from getting malaria in the first place. If you haven�t turned in your blue envelope yet, please do so during this coming week. You can place it in the collection or bring it by the rectory. If you didn�t get a blue envelop, there are some at the main entrance of the church. Thank you again for your goodness! Good Friday: March 21,2008 at 7:30 p.m.
in concert with the adult and teen mnissions. If you haven't yet turned in your Bed Net donation, please put it in the collection this week or bring it to the rectory. Thank you very much. I�d guess that if we really understood the mystery we celebrate this Thursday, Friday and Saturday, we�d have grasped the essence of Jesus� gospel. These two quotes from The People�s Companion to the Breviary, published by the Indianapolis Carmelites, express the meaning of these days much better than I can. You might want to reflect on them on Holy Thursday and Good Friday. �The cry of Jesus on the cross at the very end was, therefore, the cry of awareness that all was indeed accomplished, brought to its consummation. He knew that he could, at last, give back to the One he loved the unshackled fullness of love, and in so doing, carry with him on the surge of that passion the love which is the essential being of all creation. This is, in a sense, the moment of resurrection, or rather it is the moment at which that process begins, for the resurrection is not a single event, but the ever-extending �outflow� of the energy previously dammed up by the power of sin and death. Rosemary Haughton, The Passionate God, p. 153. If you possibly can, please come to the services which are listed in the bulletin proper. You won�t regret it. God bless you! after his betrayal by Judas at the Last Supper. If you haven�t come up, please do even if you can stay for just a short period of time. Adoration will continue until 10 pm that evening. If you have some time next Saturday morning, we�d love to have your help preparing the church for Easter! Please come at 9:30 am in your grubbies and with a whisk broom and dustpan and we�ll work on the nooks and crannies which our excellent janitors don�t have time to clean. Then we�ll decorate, so all will be ready for the Easter Vigil and Easter itself. If you have questions, please call S. Sheral at the rectory. Thanks much! to the Catholic Relief Services. As of 3/11/08 187 Families have pledged $43,005.10.